• Discusses the cybersecurity requirements of the largest U.S. trading partners in Europe, Asia, and Latin America, and specifically addresses how these requirements are similar to (and differ from) those in the U.S.
Cybersecurity Law is appropriate as a textbook for undergraduate and graduate-level courses in cybersecurity, cybersecurity law, cyber operations, management-oriented information technology (IT), and computer science. This book is also an ideal reference for lawyers, IT professionals, government personnel, business managers, IT management personnel, auditors, and cybersecurity insurance providers. 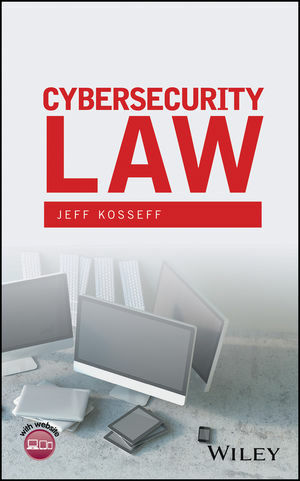 JEFF KOSSEFF is Assistant Professor of Cybersecurity Law at the United States Naval Academy in Annapolis, Maryland. He frequently speaks and writes about cybersecurity and was a journalist covering technology and politics at The Oregonian, a finalist for the Pulitzer Prize, and a recipient of the George Polk Award for national reporting.